What a great month for fishing in The Everglades November was – With the air and water temperature dropping a few degree’s the fishing was excellent . The Redfish did not let us down this month we had many days were we found schools of Redfish that where hungry and on the bite. The bait we had our best luck on where live pilchards and fresh cut ladyfish . Most of the Redfish we caught were in the 2 – 10 lb range . Mixed in with the Redfish where a few nice size Snook, but the best Snook action was in the rivers and backcountry where the water was warmer. The Trout fishing this month had also been on fire, we having been catching nice size Trout on the grass flat and in the deeper cuts along the mangrove island .The bait we been having the best luck on have been a root beer jig bounced slowly along the bottom . The Pompano fishing has been picking up this month , we been having some great luck catching some nice size Pompano on the grass flats using 3/8 oz tube jig. The Mackerel have also providing us with some good action this month , Mackerel are great fish to catch they can provide you some fast and furious action. Overall November fishing has been great and with the live bait still around the fishing should remain excellent. 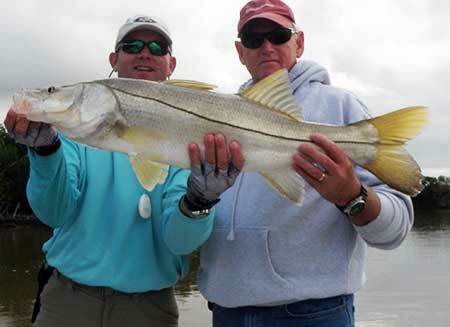 December fishing should remain good just like November with the cooler air and water temperatures look for the Snook to move deeper into the backcountry where the water will be a lot warmer . Since Redfish are not affected by the cooler water temperatures the Redfish this time of year will still be hanging around the outside points and islands . This time of year is one of the best time for catching Trout and like November The Trout will be all over the grass flats and in the deep passes . Trout can provide some non stop action and make for great fish dinner. Pompano fishing this time of year can be red hot ,Pompano love to hang on the grass flats where they like to feed on small sand fleas . Pompano pound for pound are one of the best fighting fish and like Trout provide for some great eating .